Applications are being accepted until Sept. 25, 2015, for the 2016 cohort of the Global Leadership Academy. Launched during the 2011-12 academic year, the Global Leadership Academy is a Webster University employee leadership development program created to invest in employees and advance internal talent and leadership. GLA fellows work side by side as they explore leadership and learn the value of leading from wherever they are in the University. Find the information for applying at the Global Leadership Academy site. Past participants cite the GLA experience as a transformative one. "GLA truly opened the world for me. My program is only located at the St Louis campus, and our students aren’t as able to travel abroad as other majors. I have a better understanding of the Webster community and how I fit in. It has helped me understand my own strengths and challenges as a leader, which I hope will make me a more effective leader in my department." "The Global Leadership Academy is an immensely valuable experience. The dedicated time we get to spend together really allows for collaboration and relationship building. Spending a week in Vienna was a transformational experience because together we navigated a foreign place and bonded over the common experiential learning experience. We ask our students to become global citizens, and this time together in Vienna gave us a glimpse of what a global citizen might look like. By visiting an international campuses, we not only talk the talk, but we walk the walk of what we want a Webster student to gain by taking advantage of everything Webster has to offer." 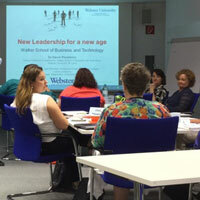 "Webster facilitates leadership development in a way that only a true global institution can. Our immersion experience in Vienna allowed us the opportunity to engage, learn, and develop ourselves while gaining new perspectives on higher education, and how Webster's strategic global philosophy impacts every team member at every level." Look for more information on upcoming information sessions in the weeks ahead.